Whether you’re still mourning the result of the EU referendum or are one of those who sees Brexit as some brave new dawn (I know you’re out there), if you’d rather not see the break up of the UK then take a moment to consider this: Brexit is an illustration of the price we pay if we neglect to counter relentless grievance-mongering against a long-standing Union. Alternatively, if you’re against Brexit but in favour of Scottish independence based on some emotional or “democratic deficit” based argument, I hope what follows may at least give you some pause for thought. If however you’re in favour both of Brexit and Scotland leaving the UK ... well I’m afraid I can’t help you, best you stop reading now. It’s probably fair to suggest that what we saw with the EU referendum was the rational economic arguments against Brexit losing out to the emotional “taking back control” arguments in favour. Conversely, the Scottish Independence referendum was won by many voting No because their head was convinced by the economic arguments against, despite their heart being tempted by the emotional case for. That’s partly because the economic arguments against Scottish Independence were an order of magnitude more compelling that those against Brexit: however bad you think Brexit is for the UK, exiting the UK would be so much worse for Scotland. But what I want to focus on here is the nature of the emotional arguments in favour of Union, and the fact that far from being distinct or conflicting, the economic and emotional cases are inextricably intertwined. The economic case only exists because of the emotional case, it’s just that the emotional case is so deeply ingrained in most of us that we struggle to articulate it. This debate matters and it matters now. If we wait until the imminent threat of another referendum before bothering to make the positive emotional case for the UK, we risk seeing Scotland’s relationship with the UK following the same path as the UK’s with the EU. Relationships suffer if emotions are neglected; a good marriage needs to be worked at. In part this formulation simply relies on the reader’s sense of identity meaning that “we” and “Scotland” are emotionally synonymous. Of course those who are happy to think of “we” as the people of the UK can simply substitute “the UK” for “Scotland” in the phrase above and - if you’re so minded - this phrase then becomes an articulation of why we should leave the EU. There’s an obvious irony to the fact that the SNP’s core argument for independence is effectively the same as UKIP’s “take back control” argument for the Brexit the SNP so vehemently oppose. But what of those who intuitively have a primarily Scottish sense of identity? 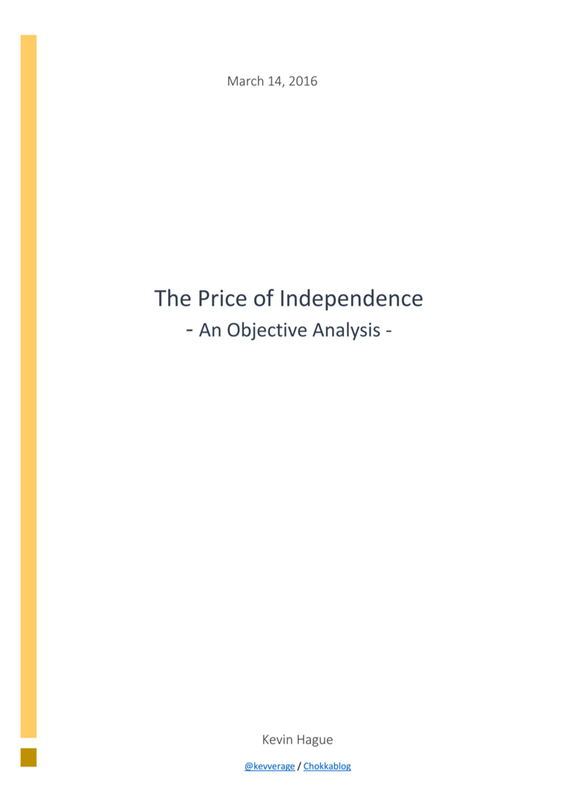 For those people, the fundamental issue should be that the implied logical connection between the SNP’s statement and the conclusion that Scotland should be independent doesn’t actually exist; you can agree that “decisions about Scotland’s future should be taken by the people of Scotland” without concluding that Scotland should be an independent country. Representative democracy allows us to decide how best to define which group of “us” should make what decisions. We decide that some issues make sense controlled at local council level, some by the constituent nations within the UK, some by the UK as a whole. Of course many also believe that some are better taken at an EU level or by the United Nations. So what some lazily term a “democratic deficit” others see as simply the result of deciding to participate in a democratic hierarchy that allows some decisions to be taken as part of a larger whole for a wider common good. The biggest weakness in the SNP’s argument is of course the fact that the 2014 independence referendum took place and that the result was so clear. That vote wasn’t just about self-determination, it was self-determination. It was the purest possible demonstration of the people of Scotland making a decision about Scotland’s future – and we decided that our economy and society would be best served by remaining part of a wider democratic union. Just because the SNP don’t like that answer doesn’t make it not so. The SNP would of course be quick to point out that no decision can be permanent and since the indyref there has been “material change” with the EU referendum vote threatening to see Scotland “dragged out of the EU against our will”. Of course there have been other “material changes”, not least those to the economic case for independence. The oil revenue forecasts used by the SNP to underpin their fiscal projections are now known to have been recklessly optimistic and the SNP have accepted that they need a more credible answer to the currency question than simply saying “we’ll keep the pound” (but have yet to find one). The deafening silence from the “SNP Growth Commission” suggests they’re struggling to find a palatable strategy for maintaining an independent Scotland’s fiscal sustainability without slashing public services and while also finding the capacity to invest to grow the Scottish economy faster that the rest of the UK. They may be finding that it’s a lot easier to complain about how things are than it is to outline a credible alternative for how things should be. The Nationalist’s biggest economic problem though is Brexit itself. Their previous assertion that Scotland’s trade with the rest of the UK would be unaffected by independence has gone from being at best dubious to now completely indefensible. If Brexit means the UK becomes subject to trade barriers with the EU, then a decision about Scottish independence becomes in part a decision about which trading block we favour: we would have to choose between the UK and the EU (or quite possibly risk ending up in neither). The fact that we export four times more to the rest of the UK than we do to the rest of the EU is now a pretty compelling economic argument against Scottish independence. But just as the Nationalists need to work on their economic case, so those of us who intuitively feel that the Union is “a good thing” need to find better ways to articulate and communicate our emotional case. One blog certainly won’t do it, but let me make a tentative start. The people of the UK are bound together by much more than a common language and the economic self-interest of a shared currency and the UK-wide single market. We have a long history of common endeavour and a shared a sense of responsibility to look after all of those who live on these islands. This results in what we might term an implicit moral contract that most of us accept without ever really considering it. This assumed contract means that wherever you live in the UK, whatever your background, class or economic circumstances, we will pool together to look after you. There are standards of education you should receive, healthcare you should access, public services you should be able to rely on, a sense of security you should feel and a standard of living you should be able to maintain which should exist wherever you live within the UK. These things should not be based on the economic contribution you individually (or your region collectively) make. As a matter of principle we pool and share resources to ensure that basic standards are guaranteed - and over time raised - for all of “us” in the UK. Needless to say, politicians will make their own cases for how best to fairly go about it and we can argue the merits of their different strategies all day long - but I’d hazard that few of them would disagree that their aim is to deliver against this contract, that it transcends party politics. This moral contract lies at the heart of the emotional case for maintaining the Union and fairly obviously underpins the economic one. If you accept this implicit moral contract, questions like “why should we share our oil?” or “why should Scotland need fiscal transfers from the rest of the UK?” just seem daft: pooling and sharing happens because it’s the morally decent thing to do. Similarly the flaw in the thinking which suggests “full fiscal autonomy” for any constituent part of the UK is some kind of ideal end-game becomes clear: if we economically ring-fence any geographic area of the UK we necessarily break this contract. Fiscal transfers are not a symptom of regional economic failings, they're the tangible result of a positive moral choice. Referendums certainly (and general elections possibly) can offer us the chance to choose to narrow the definition of the “us” that this moral contract applies to. Just as the EU referendum appears to have shown that many believe “we” shouldn’t include our EU neighbours, so it’s fair that Scottish Nationalists are free to argue that “we” shouldn’t include those with whom we share these islands. Those committed to breaking up the UK will keep working towards it. Those of us who disagree with them, who believe that more unites than divides us on these islands, who believe that this implicit moral contract is something precious to be cherished - it's time we got to work too.